The producer of this years Eurovision, the Portuguese broadcaster RTP, has determined and revealed the running order for the two semi-finals at Eurovision Song Contest 2018. The last five years the producers of the shows have decided the running order based on an allocation draw. The allocation draw took place on 29 January 2018. 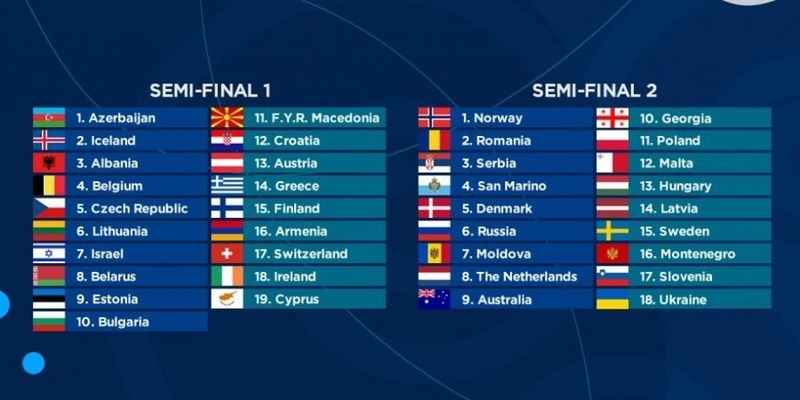 Here the participants were distributed to the two semi-finals, and it was determined whether each country will participate in the first or second part of the semi-final. We also know now, who will sing Eurovision song number 1500. The running order for the Grand Final will be decided by the broadcaster RTP after Semi-Final 2 on Thursday 10 May 2018. The decision will be based on a draw, that determines whether each qualifying country will participate in the first or second part of the Grand Final. It has already been decided that Portugal, Spain and United Kingdom vote in Semi-final 1, and Germany, France and Italy vote in Semi-final 2. By draw it is decided that Portugal will be performing as song number 8 in the Grand Final.